PracticeLink.com S UMMER 2018 31 L E G A L M AT T E R S soon-to-be-former employer. For financial and legal reasons, it is imperative that any physician transitioning jobs ensures the tail insurance is resolved before the job switch becomes official. Have you been paid for what you earned? 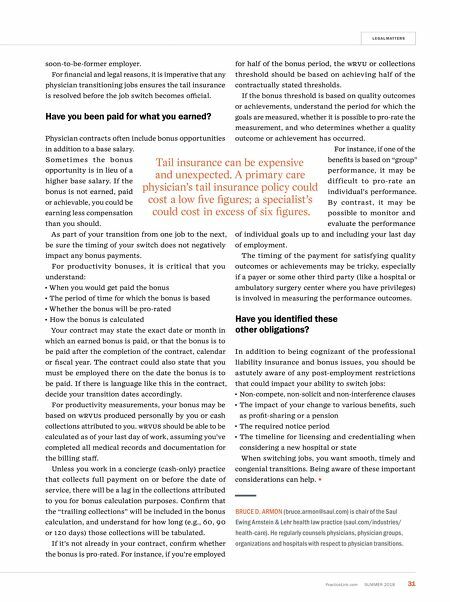 Physician contracts often include bonus opportunities in addition to a base salary. Someti mes the bonus opportunity is in lieu of a higher base salary. If the bonus is not earned, paid or achievable, you could be earning less compensation than you should. As part of your transition from one job to the next, be sure the timing of your switch does not negatively impact any bonus payments. For productivity bonuses, it is critical that you understand: • When you would get paid the bonus • The period of time for which the bonus is based • Whether the bonus will be pro-rated • How the bonus is calculated Your contract may state the exact date or month in which an earned bonus is paid, or that the bonus is to be paid after the completion of the contract, calendar or fiscal year. The contract could also state that you must be employed there on the date the bonus is to be paid. If there is language like this in the contract, decide your transition dates accordingly. For productivity measurements, your bonus may be based on wR vu s produced personally by you or cash collections attributed to you. wR vu S should be able to be calculated as of your last day of work, assuming you've completed all medical records and documentation for the billing staff. Unless you work in a concierge (cash-only) practice that collects full payment on or before the date of service, there will be a lag in the collections attributed to you for bonus calculation purposes. Confirm that the "trailing collections" will be included in the bonus calculation, and understand for how long (e.g., 60, 90 or 120 days) those collections will be tabulated. If it's not already in your contract, confirm whether the bonus is pro-rated. For instance, if you're employed for half of the bonus period, the wR vu or collections threshold should be based on achieving half of the contractually stated thresholds. If the bonus threshold is based on quality outcomes or achievements, understand the period for which the goals are measured, whether it is possible to pro-rate the measurement, and who determines whether a quality outcome or achievement has occurred. For instance, if one of the benefits is based on "group" performance, it may be difficult to pro-rate an individual's performance. By contrast, it may be possible to monitor and evaluate the performance of individual goals up to and including your last day of employment. The timing of the payment for satisfying quality outcomes or achievements may be tricky, especially if a payer or some other third party (like a hospital or ambulatory surgery center where you have privileges) is involved in measuring the performance outcomes. Have you identified these other obligations? 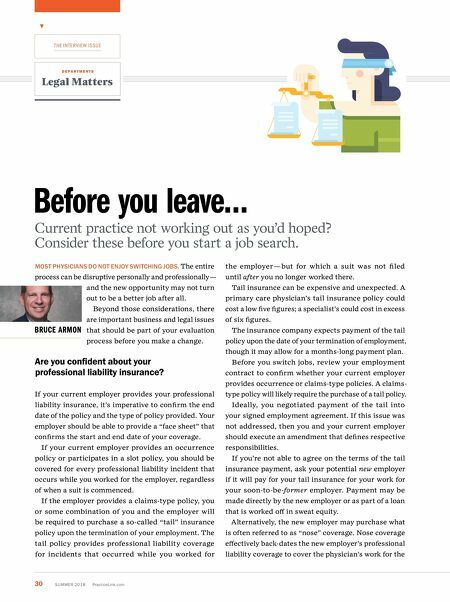 In addition to being cognizant of the professional liability insurance and bonus issues, you should be astutely aware of any post-employment restrictions that could impact your ability to switch jobs: • Non-compete, non-solicit and non-interference clauses • The impact of your change to various benefits, such as profit-sharing or a pension • The required notice period • The timeline for licensing and credentialing when considering a new hospital or state When switching jobs, you want smooth, timely and congenial transitions. Being aware of these important considerations can help. BRUCE D. ARMON (bruce.armon@saul.com) is chair of the Saul Ewing Arnstein & Lehr health law practice (saul.com/industries/ health-care). He regularly counsels physicians, physician groups, organizations and hospitals with respect to physician transitions. Tail insurance can be expensive and unexpected. A primary care physician's tail insurance policy could cost a low five figures; a specialist's could cost in excess of six figures.